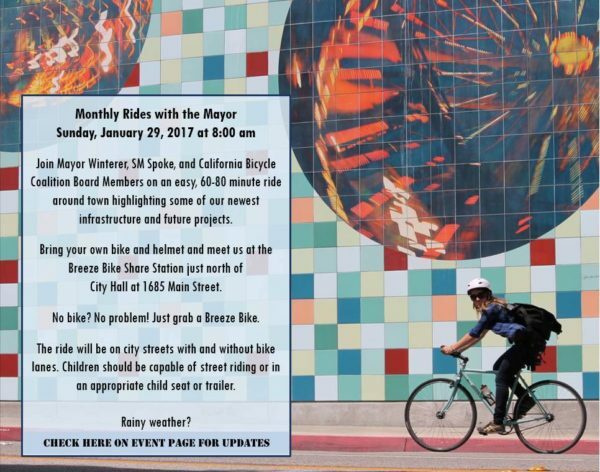 Join Santa Monica Mayor Ted Winterer for the first monthly community bike ride of his tenure on Sunday, January 29. The roughly six-mile ride (about an hour to an hour and 20 minutes long) will start outside of City Hall at 8 a.m. and will also include Santa Monica Spoke and members of the California Bicycle Coalition’s board. During the ride, participants will get a chance to see some of the improvements the city has made to encourage bicycling and to hear about upcoming projects that will make the streets safer. “Biking is my preferred way to get around town and it can be a great way to connect with people. These monthly rides are intended to do just that – meet, talk, and explore the city on bike,” said Winterer, who was appointed mayor last month after he was reelected to the City Council in November. “I hope people who don’t typically participate in group rides come out for a little exercise and conversation,” he said. People are encouraged to bring their own bikes and helmets. For those who want to participate but don’t have their own bikes, Breeze Bike Share bikes will be available to check out. The route will take riders through city streets, some without bike lanes. For updates and changes, please check here.